Consistency is becoming her middle name. This is going to be a scattered post, and I am ok with that. It has been a scattered weekend. Lots of stuff going on that is random and all sort of ended-up fitting together quite well. Saturday morning I worked in the greenhouse like I “normally” do. I put normally in quotes, as lately there hasn’t really been a true normal for me. I have missed entire months of working here during the past summer due to travel schedules and stuff like that. It was actually good to be back among the ivy plants (and the Ivy cat [who got her stitches out on Saturday too!]) for a couple of days. I miss being there and I know that I will miss this greenhouse (and those in it) when I leave. The ironic bit? I have never really liked ivy at all, and that is what I have grown for nearly 10 years. Funny thing, life is…. Saturday night I went to a birthday party of a friend of ours, Laura. It was held down in the Latin Quarter restaurant/club/bar at Universal Citywalk. In the middle of the dinner I thought that I was going to be ill and went to the bathroom. I hadn’t felt great, but suddenly I was afraid of losing my cookies all over the lovely table with all of Laura’s lovely friends at it. To show you how ill I flet, I didn’t get a travel crochet picture even though I had brought it along! Needless to day, Chris and I left early before A.) I made a splash (literally) and B.) before any dancing began. I mention the 2nd because Laura and Tony, her husband, are Dominican and LOVE to dance. Case in point….Chris and I went to Thanksgiving at their house this last year. From the time that we got there to the time that we left, there was someone always dancing in their family room. In fact, most of the time you couldn’t walk through the house for all of the family and friends shaking it! Coming from some pretty reserved Presbyterian/Methodist midwestern stock, this was a completely different way to celebrate Thanksgiving to me, and it was great! I spun 2 bobbins full of some oatmeal colored, blue Faced Leicester singles in bits andspurts over the weekend. Whenever I was sitting, I would spin a little bit. The first bobbin was pretty consistent, the second bobbin quite so comparatively. This is some lovely wool, a mixture of gray, black and white with a little brown thrown in for good measure. But it is quite well blended, so no one color really stands out at any given time. Tonight I plyed them together and made some very nice, fairly consistent yarn. I can see that I am getting better and, even, faster. I will have pictures of this when I am done processing this yarn. It’s sitting in it’s soak right now. This afternoon, we had to go to the mall. I abhor going to the mall with a passion that rivals my dislike of rap. But, this morning, Chris laid down on my glasses on the bed where one of the cuddle pups managed to knock them. They were pretty busted, and the only place that we could think of that could fix them was the jewelery/watch/glasses repair place in the mall. We get there and the supposedly fix-it dude said that he couldn’t fix them and that we should go down to Lens Crafters. We went down and this absolutely wonderful lady fixed my glasses for free with little more than a pair of needle nose pliers, tweezers and a push pin! I will probably get my next pair of glasses there just for this reason. So, while we were in the mall, we decided to go to the new(ish) Apple store. Chris and I have been discussing getting a Mac laptop for me for the coming travel and school and stuff. My current desktop has been giving me more and more trouble and a laptop just made sense for me with the stuff that I do. I had been eyeing the Macbook Pro, but Chris and the salespeople that helped us pointed out that it was more than a little overkill for what I plan on doing with it. That and $1000 difference in price convinced me that the regular Macbook would work just fine for me. It was amusing that when I had to get out my license for something and took half my travel crochet out of my (large) dachshund purse our salesperson, Lauren, noticed it right off andasked if I knitted or crocheted. 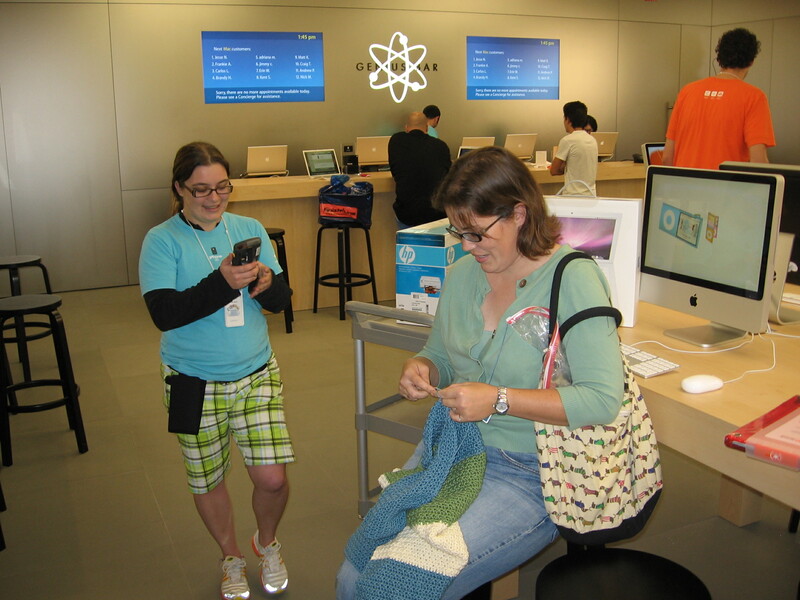 Come to find out, she is a knitter and a fan of Stephanie Pearl-McPhee as well, so I got to take this “where Sarah is crocheting now” photo there. Lauren is the girl standing next to me checking us out. The white box behind me? My new Macbook laptop computer. I have already been playing with the photobooth feature a bit, but since I am typing this up for what will be one of the last times on my old desktop, you will not get to see the results of the photobooth play time. Chris is currently importing data and all sorts of stuff onto the new computer for me, so it is a it busy.